We’d love your help. Let us know what’s wrong with this preview of Demon Walk by Melissa Bowersock. 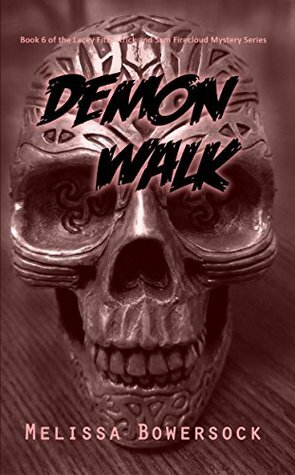 To ask other readers questions about Demon Walk, please sign up. With Lacey and Sam’s notoriety growing they are contacted by the Director of Mission San Juan Capistrano to investigate the strange happenings going on at their mission. While Lacey looks for connections from the mission’s past, Sam searches the more esoteric connections. With their combined resources and skills will Lacey and Sam be able to determine the source of the ancient magic they have to face and defeat? Find out as Ms. Bowersock includes more members of Sam’s family and challenges Lacey to believe in herself. I found “Demon Walk” enthralling. Ms. Bowersock continues to captivate me with every story she spins. Her secondary characters are strong and make each story well-rounded, which aids in the suspension of disbelief. I highly recommend this series to readers of paranormal mysteries. I guarantee you’ll love Lacey and Sam. I can’t wait to see where their next case takes them. Format/Typo Issues: No significant issues. Sixth in the Lacey Fitzpatrick and Sam Firecloud series, the private-investigating duo are asked to get to the bottom of a menacing evil threatening the lives of the San Jan Capistrano mission. A tough nut to crack, this one, as some of the usual methods aren't enough to combat a killer force. It’s so easy to slip into this duo’s adventures. They’re like old friends, their tales like a comfy sweater or slippers. Better still, their personal relationship is heading in the direction us fans want. A Sixth in the Lacey Fitzpatrick and Sam Firecloud series, the private-investigating duo are asked to get to the bottom of a menacing evil threatening the lives of the San Jan Capistrano mission. A tough nut to crack, this one, as some of the usual methods aren't enough to combat a killer force. As always, Bowersock strikes the perfect balance, careful to make this a compelling supernatural mystery without overdoing the romantic elements between Lacey and Sam. Lacey Fitzpatrick and Navajo medium, Sam Firecloud, are called in by the Mission of San Juan Capistrano to find the source and get rid of an evil presence that threatens not only the workers of the Mission but also the students there as well. While Sam determines the location of the source and plans to fight it with everything he has, Lacey researches the area and finds the story behind the story. Will Sam have enough power to over come this spirit or will he and Lacy become the next victims of Lacey Fitzpatrick and Navajo medium, Sam Firecloud, are called in by the Mission of San Juan Capistrano to find the source and get rid of an evil presence that threatens not only the workers of the Mission but also the students there as well. While Sam determines the location of the source and plans to fight it with everything he has, Lacey researches the area and finds the story behind the story. Will Sam have enough power to over come this spirit or will he and Lacy become the next victims of it?